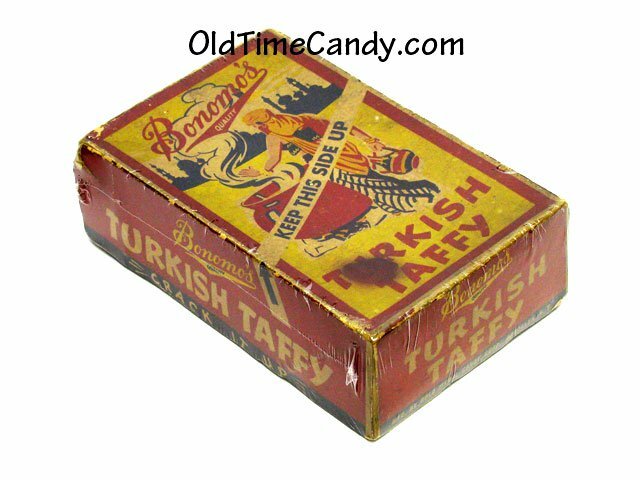 Bonomo's Turkish Taffy, which first appeared as a nickel bar after World War II, became a favorite with the economy-minded. Unlike some of its competitors, which melted in your mouth, Turkish Taffy eroded slowly, and it was so chewy that a single bar could last through most of a double feature at the movies. Mr. Bonomo (pronounced BAHN-uh-moh) was born into the candy business and actually had Turkish roots. His father, Albert J., was a Sephardic Jew who had emigrated from Turkey. In 1897, the year before Victor Bonomo was born, his father started making candy in Coney Island to supply concessions at the amusement park. After World War I, Victor joined his father in running the candy factory on Eighth Street in Coney Island, where saltwater taffy and hard candies were produced. As World War II ended, sugar rationing gave way and the entire country was eager to indulge its sweet tooth. Bonomo's joined the race to satisfy the surging demand, promoting three candy bars, "Thanks," "Hats Off" and "Call Again," which Tico Bonomo, Victor's son, described as "poor man's Milky Ways." Then the candy cooks at the Coney Island factory came up with a batter of corn syrup and egg whites that was cooked and then baked. "It was not really a taffy but what is technically known as a short nougat," explained Tico Bonomo. Nor was it Turkish. "It was not a family recipe and the name we chose, 'Turkish Taffy,' just reflected clever marketing," he said. It cooled into sheets the size of school desks, which were distributed through Woolworth stores around the country. Clerks at the candy counters used ball-peen hammers to whack the sheets, breaking off shards that were sold by the pound. Apparently this method of distribution merely whetted appetites for the candy, then available only in vanilla. Mr. Bonomo had the slabs cut into panels the size of 1945 nickel Hershey bars, which were larger that 1999 65-cent Hershey bars. The bars were packaged in wrappers that showed smiling men in fezzes pouring batter into a huge vat. Of course, in Turkey, the fez had been outlawed by Kemal Ataturk in the 1920's, but back in the 50's the design drew no complaints. The candy grew popular, eventually being distributed far beyond the metropolitan region into much of the rest of the country. Before the widespread use of air-conditioning, Turkish Taffy had some problems penetrating Southern markets, where warm temperatures turned the bars from hard to gooey. The problem was eventually overcome with new wrappers. In the 1950's, Bonomo's Turkish Taffy advertised on children's television programs, among them "The Magic Clown" and "Wonderama." The ads featured puppets named Bo, No and Mo. It also sponsored joint promotions with the Duncan yo-yo company. In time, three new flavors appeared: chocolate, strawberry and banana. According to Tico Bonomo, the company sold 80 million to 100 million bars a year in the 50's and 60's and employed as many as 350 workers at the Coney Island plant, where it also produced hard candy. Victor Bonomo retired in 1970 and moved to Florida with his wife, Zephra, who survives, as do Tico Bonomo and nine grandchildren and great- grandchildren. Bonomo's Turkish Taffy changed hands a few times, in 1980 becoming part of Tootsie Roll Industries of Chicago, which stopped making the candy in 1989. Ellen Gordon, president of Tootsie Roll Industries, said that the company phased out the product when demand declined as tastes changed. When I was six years old, I had my first taste of Bonomo banana turkish taffy. I loved it immediately and started to ask for it all the time. My mother would only let me have it occasionally because she thought it would wreak havoc on my teeth. Because I wanted it more often than I was allowed to have it, one day I decided to make my own Bonomo banana taffy. I took a really nice banana, mashed it up, and shaped it into a flat rectangle. Then I wrapped it in foil and placed it in the freezer.